The London Korean Film Festival 2015 is still on and there is yet another special event happening this week! 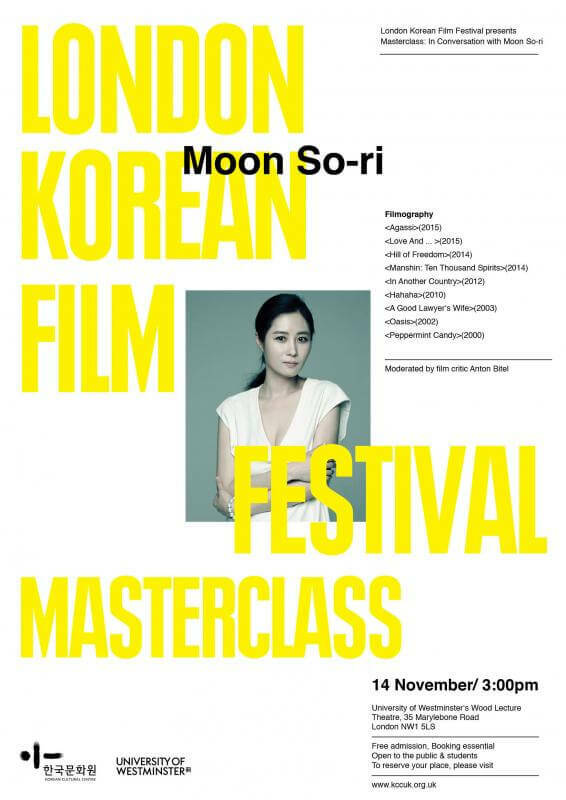 This Saturday, actress Moon So-ri will be giving a masterclass at the University of Westminster about her acting career, filmmaking and her theatre background. Furthermore, the class will address her relationship with prominent directors such as Lee Chang-dong and Hong Sangsoo, her methods on how to impersonate characters and more. She will be speaking to Australian film critic Anton Bitel, who is a regular freelancer for ‘Sight & Sound’ and ‘Little White Lies’, amongst others. Moon So-ri originally began her career on theatre stages, but in 2000, she starred in the movie ‘Peppermint Candy’, directed by Lee Chang-dong. However, it was only in her second movie ‘Oasis‘ – also directed by Lee Chang-dong – that Moon So-ri’s popularity started to grow. She also appeared in movies such as Im Sangsoo’s ‘A Good Lawyer’s Wife’, Hong Sangsoo’s ‘Hahaha‘ and ‘Hill of Freedom‘. Her latest movie “Love And…” is due to premiere in Europe soon. During the last few years, her outstanding acting skills have earned her various awards, like the Marcell Mastroianna for New Young Actor or Actress at the 2002 Venice Film Festival. Apart from acting, Moon So-ri teaches acting classes and has also been involved in filmmaking. Don’t miss out on this opportunity to listen to Moon So-ri’s stories and advice! The class will be held at the University of Westminster on Saturday, 14th November 2015 at 15:00. London-based blogger, writer and K-drama addict. Powered by coffee.